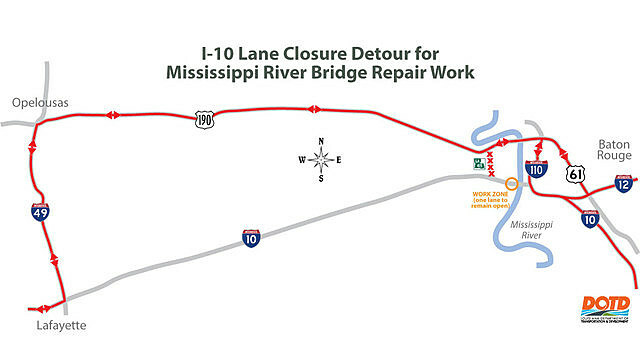 The Louisiana Department of Transportation and Development announced that on Friday, June 1, road work will begin on the Mississippi River Bridge in Baton Rouge. The repairs will happen on the eastbound approach near the Port Allen exit. This work is necessary in order to fix the failing approach to the bridge on the west bank and requires a lane to be closed while work is being done. Furthermore, a 12 foot restriction has been placed for vehicles traveling across the bridge during the closure. Motorists should expect delays during the repairs and even consider taking an alternate route. DOTD did not say how long this project is expected to last.